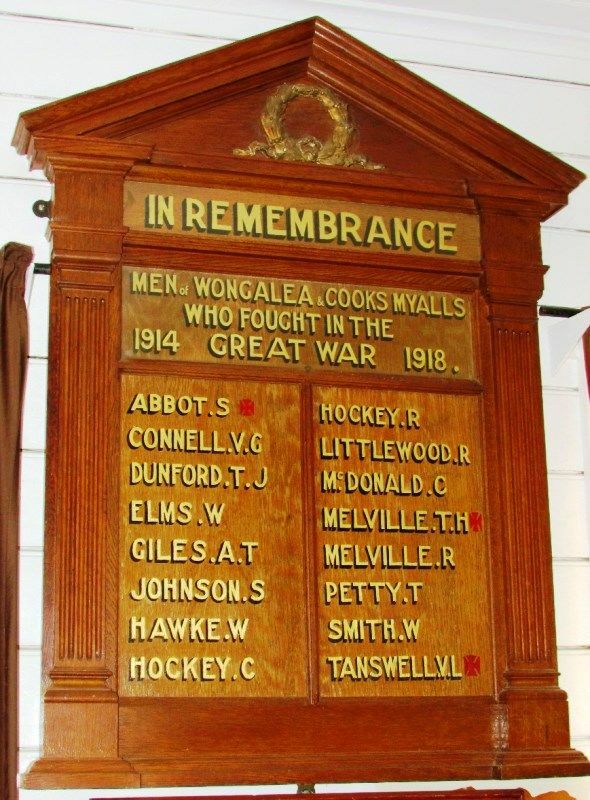 A war trophy, a machine gun, which has been in the hands of local trustees for some time, is now erected in the public school, together with a splendid honor roll in remembrance of the men of Wongalea and Cooks' Myalls who fought in the Great War. The Honor Board, which is of light English oak, is a fine piece of work, both in design and finish and Mr. A. S. Green, of Parkes, in whose hands the work was placed, is to be highly commended. The unveiling ceremony took place on Saturday last in the presence of a large and representative gathering, Mr. T. Hamilton occupying the chair. He commenced his address by expressing his pleasure, in seeing so many present on such an occasion. He was indeed proud of the young men who responded so well to the great call and sincerely hoped that British statesmen would in future do their utmost to prevent war. Western Champion (Parkes, NSW), 28 September 1922.